While I will accept that a lot of effort has been put in by the gardening industry to source and promote the very best winter flowering plants, still the range available today contains few inspirational species. But there is good reason for this. Over the winter period there are only a limited number of plant species in flower and as such there is little competition between species. This means that there isn't the need for a plant to expend valuable resources in producing large and colourful flowers at this time of year. The cold weather also means that there are few active pollinating insects so instead of using colour to attract what pollinators are left around, winter flowering plants concentrate more on fragrance instead. This has meant that winter flowering plants have evolved smaller, less attractive flowers and instead have diverted their energy into producing far-reaching, stronger perfumes. However there is one exception, the magnificent witch-hazel - Hamamelis species, hybrids and cultivars. 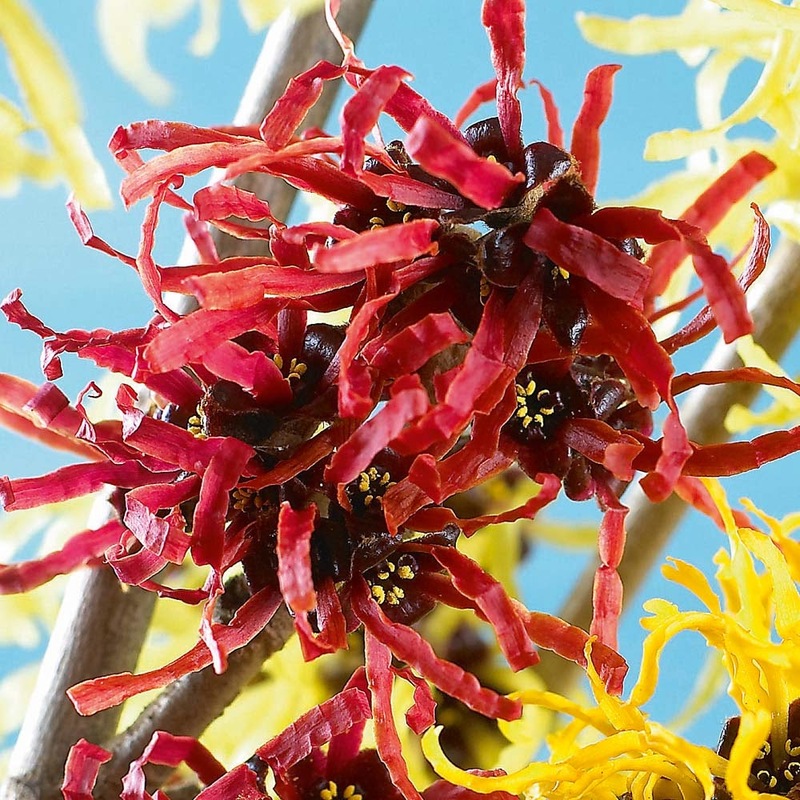 Native to China, Japan and North America the witch-hazels are genus of deciduous shrubs or small trees that depending on the species will grow anywhere between 10-30 feet tall. The word 'witch' is a little misleading as this name has nothing to do with witchcraft or the occult. 'Witch' has its origins in Middle English wiche, which itself is derived from the Old English wice, meaning pliant or bendable. To add insult to injury, neither are witch-hazels are not related to true hazels - Corylus species. 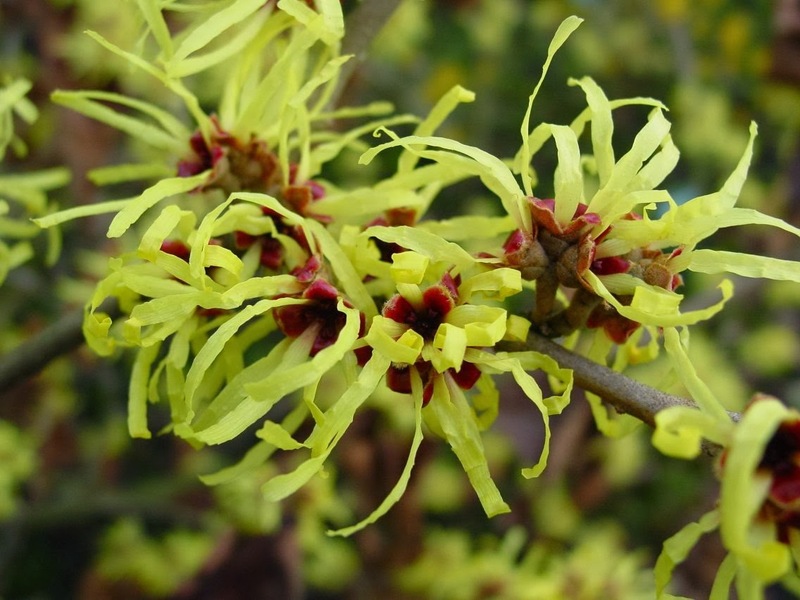 The most notable feature of witch-hazels is their spider-like yellow or reddish flowers which appear from December to March. This is usually just before or after autumn leaf-drop depending on if the weather has been cold enough. These curious strap-like flowers are extremely resistant to even the hashish weather. In addition, the witch-hazel will often show richly coloured foliage in the autumn. Hamamelis virginiana was introduced into English gardens by Peter Collinson who discovered the plant through correspondence with plant hunters in the American colonies. Collinson was a Fellow of the Royal Society and best known for his horticultural friendship with John Bartram and his correspondence with Benjamin Franklin about electricity. 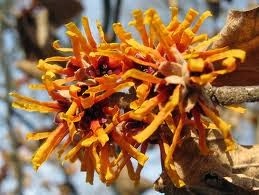 Of course the witch-hazel was well known to native Americans who produced an extract by boiling its stems. This produced a decoction, which was used to treat swellings, inflammations, and tumors. Early Puritan settlers in New England adopted this remedy and its use has now became widely established.